Sirene Dantor Sainvil (Canarsie) is a Haitian culture preservationist who used her passions to develop Fanmi Asòtò, a Haitian cultural organization whose drum performance, community workshops, and herbal teachings are rooted in Haitian Vodou. Sainvil seeks to encourage identity building for all Haitians but particularly for Haitian American youth. Paying homage to the asòtò drum, the mother of all African descended drums, her mission is to encourage identity building for all Haitians but particularly for Haitian American youth who are the next generation of Haitian culture and Vodou. As part of her Lakou NOU 2018 residency, she is developing research to answer the question: Where is the heritage of Haitian people in Canarsie preserved? How do we participate in it? 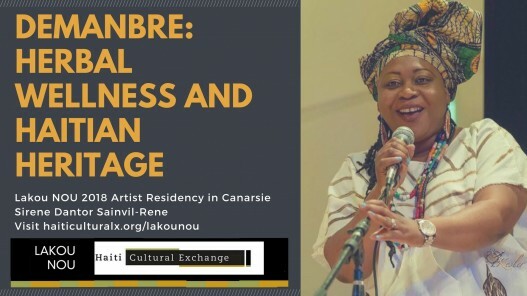 Her goal is to use her skill as a Haitian culture preservationist, singer, and Vodou herbalist to learn about the culture in Brooklyn communities, document the changes in Canarsie, and encourage people to visit Canarsie spaces. She seeks to create spaces for community dialogue through her “Fey Nan Bwa” workshops. These workshops will take place in each of the four main Lakou/Haitian communities delineated through the Lakou NOU program – Flatbush, East Flatbush, Canarsie, and Crown Heights. They intend to create a space where people can talk, learn about tradition, and share stories about their history in Brooklyn and in the Canarsie community. This event is about presenting the research I have completed in Canarsie and with residents. Through it attendees will prioritize making long lasting relationships and friendships. I hope to activate our tradition through Vodou to pay homage to our ancestors, use their energy and strength to be a part of the legacy to preserve Haitian Culture in Canarsie and to facilitate connectedness there. Bringing together a community of Vodouist with guests, and through the power of the drums, “Demanbre” seeks to create a sense of pride and power within us despite circumstances that encourage separation and negativity. The ultimate goal is to treat this residency as the beginning of a longer process for building community in Canarsie and building demand for Haitian culture preservation there. This entry was posted on Thursday, June 28th, 2018 at 4:22 pm	and is filed under Archive, HCX Programs, Lakou NOU, Uncategorized. You can follow any responses to this entry through the RSS 2.0 feed. You can leave a response, or trackback from your own site.